After reading about upcoming bind10 changes and never really being all that happy with named, I decided to look around at other solutions for DNS serving. I’ve been running unbound (along with dnssec-trigger) on my laptop for a while, so I was pretty sure it could meet my needs for a recursive/caching solution, but I hadn’t found anything to replace authoritative servers until nsd was pointed out to me. Replacing my authoritative server with nsd was pretty easy overall. I could reuse the same zone files, I just had to add a bit of nsd config to load them. My main firewall/gateway machine at home was also functioning as a caching server for machines here, so I had to replace named with nsd only listening on the external interface, and unbound only listening on all the internal interfaces. Worked like a charm. nsd now answers external queries for my domains and unbound does caching for other internal machines. My main internal webserver/mail server machine also was running named and serving some internal only zones. nsd doesn’t have any kind of ‘views’ setup like named has so I had to ponder on this for a bit until I noticed that unbound can also optionally have local data. I just setup my zones there in unbound as local-data and it then was able to do what I needed (basically I need my domains to resolve to the internal ip’s on that machine so apache is happy, etc). It can also easily resolve *.example.com to whatever single ip you like. Very handy. The only downside of this is that dnssec doesn’t work right with local-data. Perhaps if I signed the zones with the same keys at the external site it could, but not sure it’s worth the trouble. Unbound also has a nifty control program (non surprisingly called unbound-control) that can let you do things like flush cache for just a single specifc zone or host, setup a forward over a vpn or other link for just _some_ domains, etc. It’s really nice and flexable. Both unbound and nsd as very dnssec aware and will try and validate as much as possible. Also, nsd has rate limiting built in so it’s resistant to DOS or DDOS amplification attacks. So, if you are looking to replace bind, nsd seems to work nicely for authoritative and unbound does great for recursive. 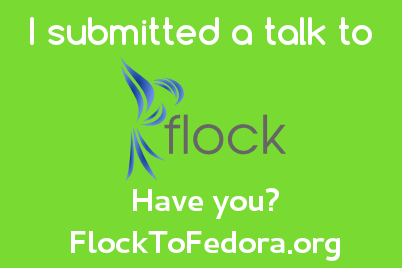 Have you submitted a talk? It’s setup more like a traditional conference (sessions proposed in advance) and it’s timed after Fedora 19 comes out, but early in the Fedora 20 cycle, so there’s good ability to plan things for the very next Fedora at it. Also, hopefully lots of folks from around the world will be able to attend. (Next years flock might well be in Europe). As usual, my problem isn’t what to talk about, but that there are too many things to talk about. 🙂 I’ve considered a “Intro to Fedora infrastructure” talk, but I’m not sure how interesting people would find it. Highly available databases: Fedora infrastructure currently depends on serveral database servers, we want to come up with a plan to make them highly available and no longer a single point of failure. postgresql wizards wanted to help us with this sprint! So, another pretty quiet week overall. There was a soname bump in libpng, but it was untagged and never landed in a rawhide compose. The maintainer is going to create a compat package for the old version first, then update the main package so things can slowly move to the new version over time instead of breaking things over many days. I’m glad people are pushing back on these kinds of things to keep rawhide more generally useful. There are of course still unannounced soname updates that do break things, but I get the impression we are slowly getting better on this. Another related nice change that landed this week is that rpm by default is only going to look for dependencies in .so files that also start in ‘lib’ or ‘ld’ and not just anything ending in .so. So far I’ve not seen any breakage due to this change and it should nicely reduce the number of deps carried in the collection. Finally, something to note about rawhide testing that I am not sure I have any kind of answer for, but I think is worth exploring: When running rawhide it’s generally a good idea to reboot frequently. New kernels arrive almost daily, and it’s good to check that things all still boot normally (this exercizes at least: dracut, kernel, grub2 or other bootloader, systemd, other stuff that starts only on boot, etc). However, this also means that there’s likely not very many people running rawhide that test longer uptimes. This would exersize things like: updates of long running processes, systemd, memory leaks, logrotation, and other things that collect up and don’t run at boot). I’ve hit several odd systemd issues on upgrade, and I’m sure there’s more out there. Perhaps we should just say that this is what branched is better suited for (as kernels and reasons for update are less frequent there), or perhaps there’s some artificial way to test this, or a vm or the like could be left running to do so. Just something to consider. I got to thinking recently: Why are interactions with some small number of community members always unpleasant? It seems to me as a general rule that the people who are unpleasant to deal with (or at least all of those I can think of in any of the communities I am involved with) all have the same basic fundamental viewpoint: Assume malice by default. By this I mean that when they see something and post/tweet/mention it, they approach it from the idea that the community or parts of it are deliberately conspiring, hiding, planning, or doing the thing with “mallice aforethought”, and that the community or parts of it must PROVE that they are not doing so. There also seems a subset that assume some kind of malicious ignorance (“You should google this, since you didn’t you are stupid and wasting my time”). In contrast the vast majority of people in communities I am involved in either assume nothing (“hey, whats up with this, can you tell me?”) or assume good faith (“This looks like a bug, but perhaps I don’t understand what you are trying to do here, can you explain?”) and are generally quite pleasant to deal with. I’m sure there are counter examples, but I wonder if in general people agree? Another week of rawhide. Only one issue really stands out from this week: The kernel switched to using a script provided by systemd to install. See: http://jwboyer.livejournal.com/47131.html for the low down. There was a slight mistake made in the script however, which meant that rawhide users wouldn’t see new kernels appear in grub.conf. This has been corrected today, and if you update to at least systemd-204-4.fc20 it should be fixed. You may need to re-install old kernels or manually add them to grub2.cfg if you want to boot them. Note that this does not affect Fedora 19 Branched, those kernels still use the old scripts and should work fine. In other news Fedora 19 Beta went out today. A pretty smooth and uneventful release day. Please do download it and try it out and report bugs on it. F19 is shaping up to be a nice release, IMHO.